Even though I am a big fan of Chinese food, I rarely make it since it just requires too much of effort; from the variety of dishes needed, to the vegetable cutting to the actual frying. It's just much more simpler to order from outside especially with the rise in affordable delivery places in Karachi which offer both Desi & Authentic Chinese based on the craving at the moment. This is the first time I made Chicken Chili Dry, basically because I had about 200 grams of chicken left over that I needed to finish and this was the recommendation I got. Since it was only 3 people at home that day, I thought it would be like a nice side-dish. Simple & easy to make, probably will add a few chili seeds next time, since it wasn't so spicy; more vegetables could be added but the beauty of the dish is keeping it simple with just 1-2 veggies in small quantities to give it some crunch and yet retain the authentic Chili Chicken flavor. Marinate boneless chicken with all ingredients mentioned in marination for 15 minutes. Heat oil in a wok and deep fry the chicken for 5 minutes and remove. Heat 2 tbsp oil in a wok. Add chopped ginger and garlic; saute it for a few minutes till slightly brown. 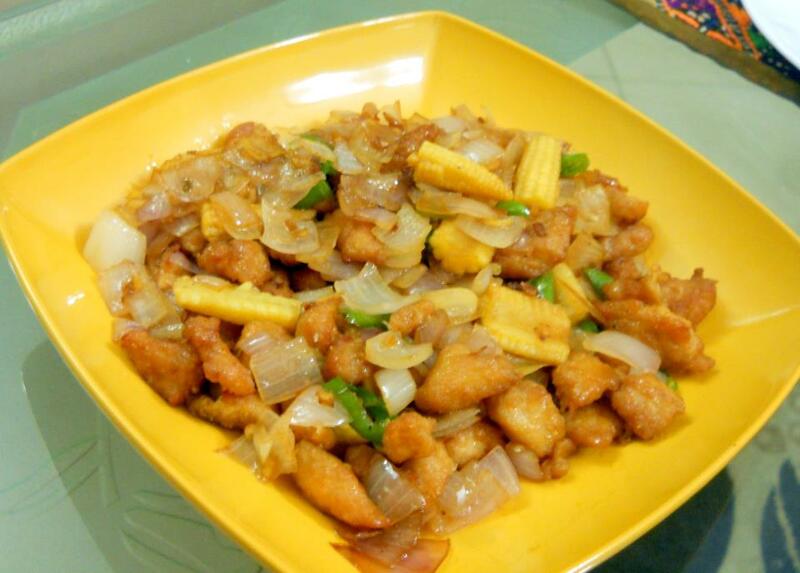 Add fried chicken with onion, green chilies, salt, sugar, soya sauce & baby corn. Cook for 2-3 minutes until heated through. Make sure you mix everything properly. Serve with hot rice.